As we farewell what has been truly eventful year, I cannot but think that this year was just a precursor to even greater things next year. For those who know and love the word of prophecy, 2016 was truly annus mirabilis. Having grown up in these amazing times it gives me great encouragement to hear brethren and sisters who have lived many years longer and have greater hindsight, who are no less awed by the extraordinary nature of current events in the last few years. 70 years since the UN resolution on the adoption of an independent Jewish state. 100 years since the Arthur Balfour declaration in favour of an independent Jewish state. God often worked with Israel in Jubilee periods. What will next years Jubilee bring for Israel? Will Israel Annex the West Bank in 2017? The annexation of the West Bank has been thrown into the limelight for the very reason that it recently became a real possibility. The prophets talk extensively about Israel inhabiting the West Bank (“The mountains of Israel”) around the time of the second advent. Ezekiel 38 gives us an indication that Israel will be inhabiting this region at the time when Russia invades. 2017 will be the first year to see both unprecedented momentum within the Israeli government to annex the West Bank and significantly less international power constraining Israel from doing so. Today, Israel’s government is more supportive of West Bank annexation than what any Israeli government has been in the past, and while every previous US administration have done their level best to stop Israel building settlements and claiming sovereignty over the West Bank, President elect Trump and his Israeli ambassador are about to free the shackles constraining Israel from doing so. A guest author recently wrote an article on this blog entitled; “Will Israel Annex the West Bank“? Its worth reading in light of recent news. Yesterday, US Secretary of State John Kerry held a press conference where he made his frustrations clear and for the first time, suggested that Israel is close to annexation. If it happened in 2017 it would certainly be another incredible milestone and a witness to the fact that the Messiah’s return is very close. Will 2017 bring Transformation in Europe? An era of global stability is coming to an end; anti-establishment nationalism is fermenting in most countries, and thrusting this unwitting world into uncharted and volatile waters. Don’t let this be a distraction; beneath the bubbling surface is a number of key projects that the Angels are working on in preparation for the return of Christ. One of these changes which is yet to take place is the transformation of Europe into the ten nations and leaders (Daniel 2, Revelation 17) who complete Nebuchadnezzar’s image. Next year will see substantial change in the geopolitical sphere with elections due in many countries, and with that, many new political parties, party policies and foreign policies will be up for grabs. Nowhere will a transformation be more likely, and more pronounced than in Europe, which is facing a tidal wave of far right, pro-Russian, anti-EU elections. Such change in Europe would be more profound than the Brexit and is likely bring about the circumstances for the image of Daniel 2, where the image stand’s in preparation to oppose Christ. Will Israel Annex the West Bank? In an astonishing turn of events, Donald Trump, who has never held any elected office, will soon hold the most powerful office in the world. Not only will the real estate tycoon and TV reality star have executive power over the state, but having secured hold of both the Senate and the House of Representatives, Trump will have secured a level of power which not even Obama was able to obtain. Yet throughout his campaign, Trump has defied every convention and turned the presidential race into a reality TV show. His rash and ostentatious behaviour which is a matter of public record includes threatening to punch protesters, making vulgar statements about women, mimicking a disabled reporter, bragging about trying to have an affair with married women and broadcasting his admission of not paying tax. While his primitive temperament has stunned much of the upper class, it is no surprise to Bible students who understand that God can – if he so desires – put in place rulers who are the basest of men. What is of notable significance to Bible students, is his unorthodox approach to US foreign policy, particularly in relation to Europe, Russia and Israel. Readers might recall that before the Brexit, most world leaders were calling for the UK to stay within the European Union, and many – like UK Prime Minister David Cameron – suggested that a Brexit could result in another World War. Ofcourse, Trump joined the chorus of those who supported the Brexit, despite its potential to significantly degrade peace and stability on the European continent. As if European security this was not a problem already, Trump believes that NATO (The European military buffer against Russia) is obsolete. Trump believes that Europe should shift its focus away from Russian deterrence and more toward combating terrorism and dealing with migrant flows. Degrading NATO in the face of growing Russian Nationalism could very well empower Russia and her interests in Europe and the Middle East. Since 1949 when Israel declared West Jerusalem its capital, and 1967 when Israel captured East Jerusalem, the United States has never once supported Israeli occupation of Jerusalem, or recognised its status as the capital city of Israel. However, Trump has already told the Prime Minister of Israel that he would recognise Jerusalem as Israels united capital. Perhaps the most internationally provocative of policies is that Trump would support an Israeli annexation of the West Bank which is opposed by virtually all of the international community. At a time when Israels government under Netanyahu has become very Zionist and his cabinet ministers are publicly speaking about West Bank annexation, this will be a time of great opportunity for Netanyahu’s government who have acknowledged that without Abbas, the West Bank would fall into the hands of the Palestinian terrorist group, Hamas. It also comes at a time when the Palestinians are using their voice at the United Nations to provoke Israel, and encourage UNESCO to ignore Jewish ties to the land including the Temple Mount, and even the Dead Sea Scrolls. This is another provocative and audacious attempt by the Palestinians to rewrite history and to erase our connection to our land. The Dead Sea Scrolls are factual and weighty archeological evidence of the presence of the Jewish people in the Land of Israel. Israeli Ambassador to UNESCO Carmel Shama-Hacohen. There is no doubt that a Trump foreign policy would be a startling difference to the activist policy that has been promulgated under Obama & Hillary. After the Brexit vote the world is moving into a new era, and one which could ultimately result in the Russian invasion of Israel prophesied in Ezekiel 38. Russia must detonate a nuclear bomb on the Bosphorus to create a 10 meters high tsunami wave that will wipe out at least 9 million Istanbul residents. Zhirinovsky is a fierce nationalist, notoriously antisemitic and a highly popular vice chairman of the Russian parliament who holds enormous influence amongst the Russian political elite. At the time of the incident, he predicted – quite accurately – that Turkey would suffer the consequences of shooting down a Russian warplane through a military coup d’état. Within 12 months, Zhirinovsky’s prediction became a reality. Putin at the time also is reported to have said the same thing – read more here – yet many seem to have forgotten that these threats were made at the time of the incident. Various coup plotters were blamed, but the instigators were never identified. For two nations who have diametrically opposed religious, cultural and geopolitical interests, the relationship between Russia and Turkey seems to have quickly and awkwardly become very entwined. History would suggest that this will have serious consequences for Turkey. The last break southward is the magnum opus of Zhirinovsky in which he expresses his worldview. “Moscow and Peter’s grad, the city of Constantine, these are the capitals of Russian kingdom. Quite a grand statement all things considered! Right in the centre of that aspiring empire, sits Israel and Jerusalem. As we know, Daniel certainly did prophecy that this would eventually happen – Daniel 11:44. In the most recent turn of events, Zhirinovsky has decided to weigh in on the US presidential elections by saying that “if Hillary Clinton wins, it will be the last US presidency ever”. In addition to the recent deterioration in diplomatic relations with the US, Russia is posturing for grander ambitions in the Middle East. The imperialistic ambitions southward are as old as the Tsars themselves, who attempted to invade Turkey when it was global super power. Since then, Turkey has receded into a republic and is far more vulnerable to Russian interests in the middle east. Whatever the result might be in the US elections within the next few weeks, Zhirinovsky will certainly be a personality worth watching. A few days ago I received an email from Isi Leibler – a Jewish journalist who writes for the Jerusalem Post in Israel. To be honest I couldn’t believe my eyes when I read his letter – perhaps I shouldn’t have been so surprised. Leibler, a Zionist, has been writing about many aspects of Israel including its relationship with global powers like the European Union, the Vatican and Putin’s Russia, which are all threatening to impose their sphere of influence on Israel in one way or another. Unwittingly he has observed and written about many of the traits that we expect to characterise the latter day Israel, prior to the return of the Messiah. The relationship with India has never been as strong as it is today and we have developed solid economic links with China, Japan and other East Asian countries. There have been remarkable diplomatic breakthroughs in Africa with the potential for major economic and political development, as well as a strengthening of relations in Latin America. The most incredible change has been in our relationships with the moderate Sunni states. We are partnering with Egypt against Islamic fundamentalists in the Sinai Peninsula and President Abdel-Fattah el-Sissi has effectively praised Israel and publicly condemned Muslim extremism. There is even covert cooperation with the Saudis and the Gulf states, which recognize Israel as a critical element in the confrontation with the Iranians seeking regional hegemony. This has yet to be reflected in the foreign policies of these countries, which still tend to engage in ritual anti-Israeli condemnations. But one senses that in the not too distant future, the winds of change will also impact on their public postures. Beyond diplomacy, in the midst of global economic chaos, Israel’s economy has been outstandingly successful. Our ongoing progress in high-tech and biotech and our global contribution to cyber defense and security represent our biggest exports. Two recent developments are amazing. The first is the discovery of gas fields, albeit ineptly handled politically, but which nevertheless presents a fantastic opportunity for us in economic and politically strategic terms which will soon be realized. The second, which we take for granted, is the remarkable success of our desalination program which provides 80 percent of our water needs and far exceeds that of any other country. It also represents yet another major contribution by Israel to global welfare. 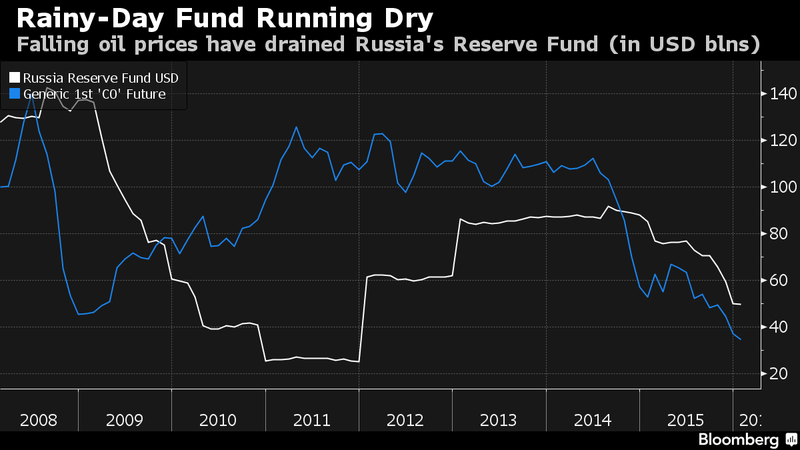 Over the past few years in Russia, two trends have started to converge: Russian funds are drying up very quickly while on the other hand, military spending is accelerating. After almost two years in recession, the country’s rainy day fund has shrunk to just $32.2 billion this month, according to the Russian Finance Ministry. 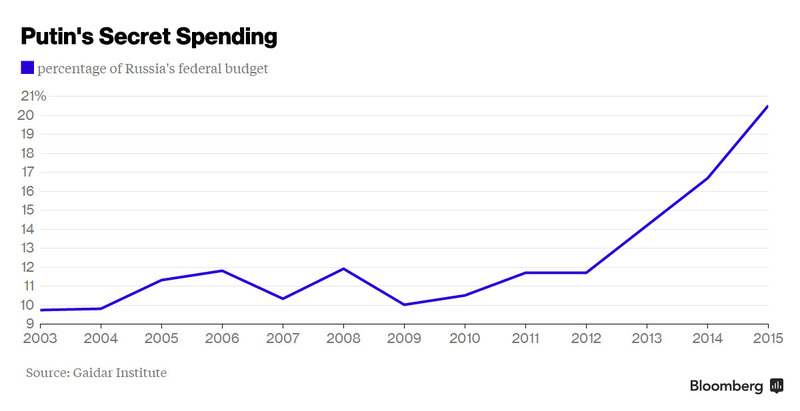 It was $91.7 billion in September 2014, just before oil prices started to collapse. And it’s getting worse. Analysts expect the fund will shrink to just $15 billion by the end of this year and dry up completely soon after that. “At the current rate, the fund would be depleted in mid-2017, perhaps a few months later,” Ondrej Schneider, chief economist at the Institute of International Finance, wrote in a note this week. As if to ignore the alarming numbers, the second trend under Putin has become evident; defence spending has been steadily rising since 2011. Ofcourse, there is only so much defence investment that can be sustained when the country is attempting to steer away from an impending debt crisis, and this observation continues to stoke the anxiety of many a financial observer. 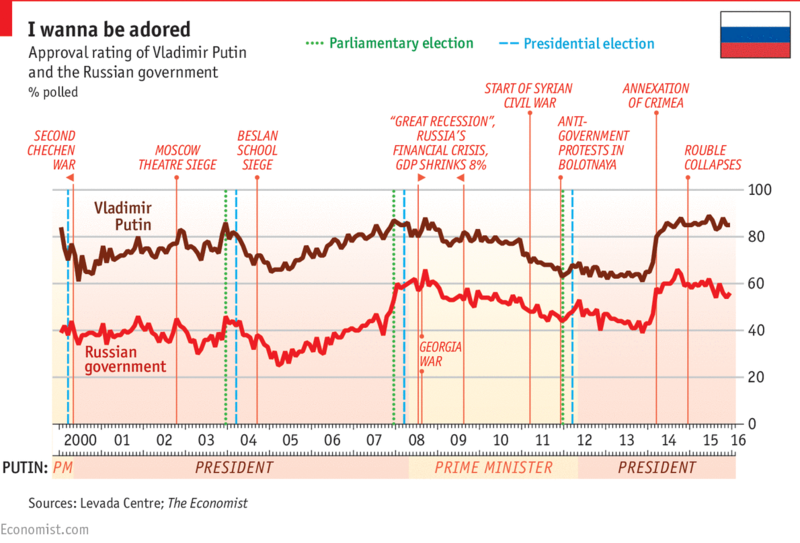 Putin pays considerable attention to his popularity as indicated by the polls. The biggest spike in popularity occurred when Putin invaded Crimea, which he considers to be Russian heartland, along with the rest of Ukraine. As western analysts point out, popularity by conquest is not a sustainable approach to politics. As Russian funds deplete and military spending increases, Putin might be pressured to invade Ukraine or Turkey to maintain political popularity. Putin’s power is being internally challenged. Since 2012, Putin has been overtly reviving and supporting a number of Roman oriented philosophies and ideologies. They include such things as taking Constantinople, and giving it to “Christendom”. The unification of Catholicism with Orthodoxy, to be led by the Pope as the religious leader, and a Russian Emporer based in Constantinople on the Byzantine model. These ideologies suggest that Russian lands extend as far as Turkey, Egypt and even Israel, infact, some would suggest that Israel is not deserving of its own nation state. These ideologies are prevalent, particularly in the far right of Russian politics amongst the nationalists, and generally, the Russian people and the clergy are both looking for the realisation of these ideologies. Both Putin’s popularity and power is increasingly dependant on the realisation of these ideologies in Russia. To students of prophecy, these things are not so surprising, and now that Israel is back in their own land (and has been since 1948) we expect Russia to attempt conquest in the Middle East to secure for itself a spoil. On that day thoughts will come into your mind and you will devise an evil scheme. You will say, “I will invade a land of unwalled villages; I will attack a peaceful and unsuspecting people—all of them living without walls and without gates and bars. I will plunder and loot and turn my hand against the resettled ruins and the people gathered from the nations, rich in livestock and goods, living at the center of the land.